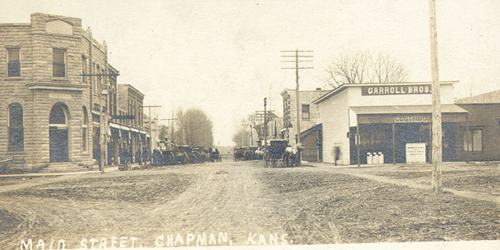 “The history of Chapman goes back to 1855 when George Freeman settled on land 4 miles North of the present town site. In 1857 John Erwin and Michael Hunt settled on land 1 mile North of the present town site.In 1858 the boundaries of Dickinson County were established by Governor Denver and the name of Dickinson was chosen in honor of Senator D.F. Dickinson of New York. 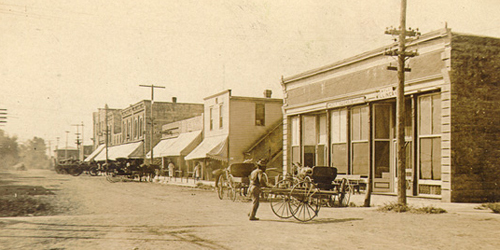 Newport was the site of the First County Seat and was Southeast of town. In this same year Mr. Erwin broke prairie ground for the first crop of sod corn. Mr. Lenon planted wheat by hand and harrowed it in with a harrow made by tying brush together and weighing it down by a log.” Click Here for More Information!